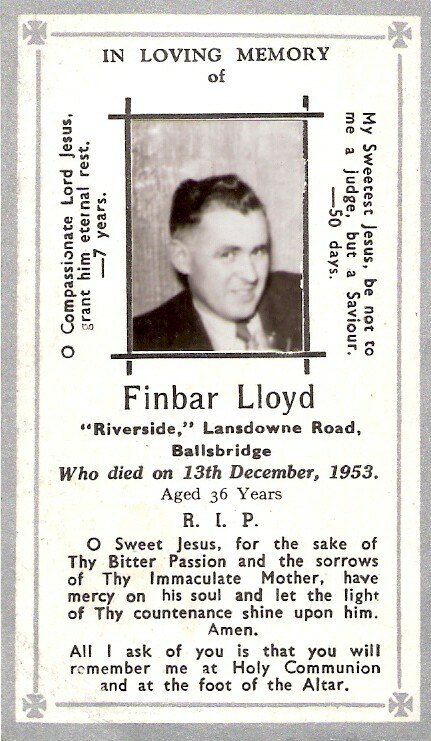 Finbar Lloyd, from mass card. Finbar Lloyd, born 10 Sep 1917. At marriage 1941 he is listed as merchant, living in his father's house, Riverside House, Sandymount. to Julia Kiely [Julia Mary Kiely, dau of Timothy Kiely, merchant]. She was living Main St, Tipperary, at mar. In 1945 her brother Gerry Kiely bought Lloyd's pub, Donnybrook from Finbar's brother Jack Lloyd. It became Kiely's pub, Donnybrook. Later, Julia's other brother Bob Kiely owned the pub. Finbar bought Rosario, 6 Herbert Rd, Sandymount (just beside Riverside House). At some point before 1951, he swapped houses with father. His father moved to Rosario. He moved into Riverside House. Listed as publican at death. 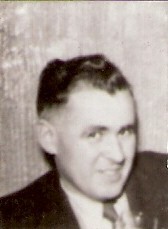 He died 13 Dec 1953 [GROI], Riverside House, age 36 yrs, of TB. Julia sold Riverside House 1954.
mar 2ndly to Judith Woodworth.